We are so proud of our senior distinction candidates whose hard work and intellectual exuberance have resulted in groundbreaking research across a wide range of fields. Emmanuel College held its annual “Senior Distinction Day” on its Boston campus on Thursday, April 28. 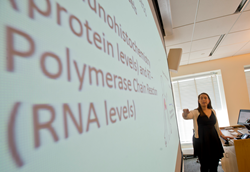 Throughout the day, there were 49 distinction in the field presentations from undergraduate students. The day was a celebration of the achievements of distinction candidates as they presented the culmination of their research. The presentations were open to the entire community including students, faculty, and staff. Emmanuel students who earned a grade point average of 3.5 in major courses had the opportunity to complete a significant research project to graduate with distinction in their field of concentration. Senior Distinction Day is an annual event that takes place at Emmanuel College. This year’s presentations represented a broad range of disciplines including Studio Art, Art Therapy, Art History, Biology, Chemistry, Elementary Education, Communication & Media Studies, Literature, History, Biostatistics, Mathematics, Philosophy, Political Science, Diplomacy & Security, Sustainability & Global Justice, Psychology, and Sociology. For the full list of project titles and abstracts, click here. The only Catholic college in the heart of Boston, Emmanuel educates and inspires more than 2,200 undergraduate and graduate students from across the nation and around the world. The College provides boundless opportunities for students to expand their worldview through rigorous coursework, collaborations with distinguished and dedicated faculty, participation in a vibrant campus community, and countless internship and career opportunities throughout the Boston area and beyond. Emmanuel’s more than 50 programs in the sciences and liberal arts foster spirited discourse and substantive learning experiences that honor the College’s commitment to educate the whole person and provide an ethical and relevant 21st-century education. For more information, visit http://www.emmanuel.edu.